Ian and I just got back from spending the weekend in San Francisco. We practically ate our way through the city, fully enjoying being kid free. 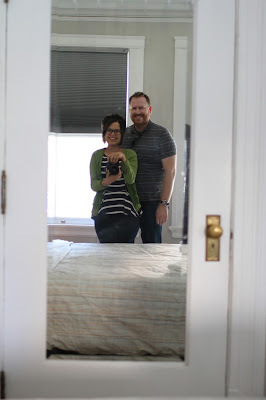 We stayed at a pretty dang awesome airbnb in the heart of the city (complete with a rooftop patio!) and managed to score street parking right in front of the building...which is pretty much unheard of for San Francisco and saved us major money in parking fees. Not ones to plan anything in advance, we pretty much planned our adventure as we went along. We hit the road close to lunch time on Saturday and stopped for lunch on the way. We got settled into our airbnb and figured out our next move...which was shopping for the birthday girl! Ian got to be the guy sitting on the couch in the changing room of anthropologie, while I tried on far too many pieces of clothing...which I never do, so totally loved. It's amazing how much more pleasurable experiences like trying on clothes can be when you don't have kids screaming at you and places to be. Knowing we had a late dinner reservation, we decided to grab some coffee at Blue Bottle, then eat ice cream before dinner. I would like to note that at coffee a random stranger made my day when she stopped to tell me how much she liked my hair. And it was sort of ironic because I just read about how we all need to complement people more because everyone likes a compliment. And I can say from personal experience, it's so true! Then we decided to walk the mile + to our next destination, Steep Creamery. On the walk, Ian brought up the time I was huge and pregnant with Isla and he wanted to go to a coffee shop "just up the street" in San Francisco and we walked and walked and walked some more and never found the coffee shop. And I was exhausted and huge and pregnant. Anyway, we walked down that very street. After ice cream, we decided to take uber back to our apartment. We had never taken uber before and were ridiculously excited about it. We did a "pool" ride and I was completely entertained by the people that got in and out on our two mile journey, not to mention that the ride was cheaper than taking the bus. Then we hung out for a bit before heading to an upscale pizza place around the corner from our apartment. Which, can I say that the pizza literally had the best tasting crust I've ever had, and I'm not normally a crust gal. Sunday morning, we went to Mr. Holmes Bakehouse which just happened to be right around the corner from where we were staying...we seriously stayed in the best spot ever. They are apparently known for their "cruffin", but neither Ian or I were impressed by it. But the churro croissant, I would wait in that long line for that thing any day! It was amazing. And the California croissant was basically sushi for breakfast and mighty tasty. Anyway, we got our pastries to go and took them back to the rooftop patio of the apartment we were staying at. It was super quiet and had beautiful views. It kind of felt like a dream, or being in a movie, being up there. Then we packed up and headed to Treasure Island Flea. I was excited about this because I've always wanted to go on Treasure Island and because I heard the flea was fun. It was an enjoyable time, that included me drinking coconut milk right out of a coconut and picking up some random goodies. On our way out, we stopped to enjoy the breathtaking and windy view of the city. Then it was back to home and real life. Now, I'm going to warn you, there are a lot of pictures. But I like pictures. I think they do a good job of telling a story. ^^ My cappuccino was so freaking hot and I kept burning my lips every time I tried drinking it for a picture, which ended up with this picture that Ian posted on instagram. ^^ The view from our apartment...which basically was all windows on the front. I totally dug it. And I may have gotten more enjoyment than one should watching people look our their windows of the hotel in the distance. ^^ Every single picture I took at the Treasure Island Flea was of succulents. I guess it's where I'm at right now ;) I did buy myself some natural deodorant from one of the vendors to try, so there's that too. If you made it all the way through, well done. Aren't pictures fun, though? !